Liao Bingxiong said "I was sad for the good people who have been victimized. I was angry against the evil people who hurt others. That was why I drew mostly sad and angry cartoons." The sad and angry cartoons showed the shocking horror, terror and sorrow. "Like a beam hanging over your head ready to come down," "Like a nightmare in which you see a meteor falling in front of you," "Like a strange corpse by the grave or a widow crying by the burning oil lamp in the middle of the night!" The following is an interview published in Southern People Weekly magazine. This interview came at a time when Liao Bingxiong was no longer able to speak clearly. This is unfortunate, because surely someone should have asked him about some of the more unusual episodes of his life. A prime example would be how he was criticized for being a rightist in 1957 and he actually believed that the criticism was correct and subsequently stayed away from drawing cartoons for 22 years. True or not? 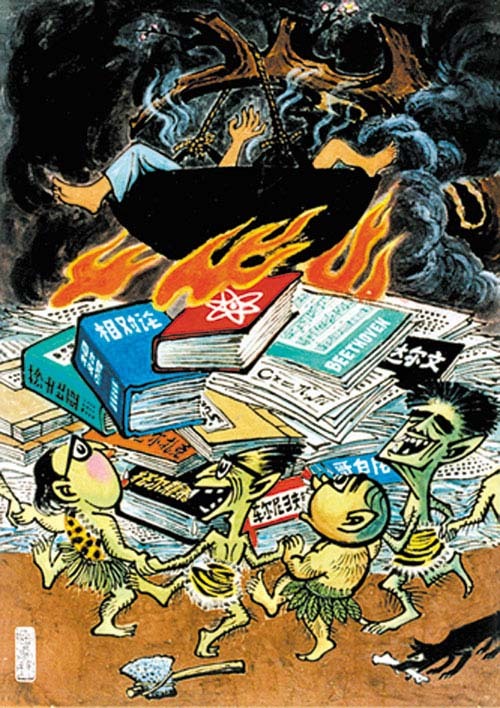 (Southern People Weekly) Cartoonist Liao Bingxiong: Traditional Chinese cartoons are dead. By Chen Jing (陈静). July 19, 2006. 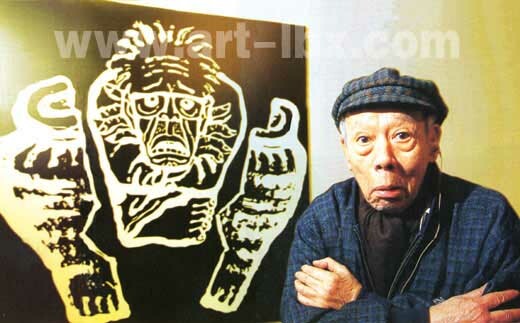 I first met the old man Liao Bingxiong in the dormitory of the Guangdong Artists Association. It was an ordinary apartment without a sofa. The living room walls were covered with his drawings, including water color landscapes, his self-portrait at age 70, and the twelve animals annotated with poetry. There is no separate study. In the bedroom, there is a wide desk in front of the bed. Thus, the studio and the bedroom are one and the same. It was small and simple. After taking a midday nap, the old man stepped out of the bedroom slowly. It is hard to believe that this pajama-clad old man whose white hair stands straight up and who looks like my grandfather is Liao Bingxiong. 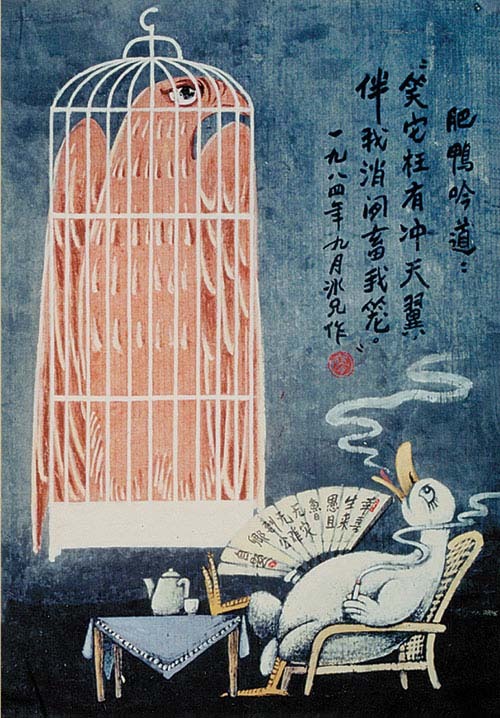 According to the Norwegian scholar of Chinese cartoons "Hemoxie," there are only two world-class contemporary Chinese cartoonists -- one is Feng Zikai (丰子恺) and the other is Liao Bingxiong (廖冰兄). The aged Liao Bingxiong wore a hearing aid and his speech was slurred. He can only spit out one indistinct Cantonese syllable slowly at a time, and sometimes these did not form complete sentences. The reporter had to communicate by paper and pencil or ask his daughter Liao Lingyi to interpret. The reporter wrote down a question: "What makes good cartoon?" After he read it, he said excitedly: "Painting is dead. Chinese cartoons are dead!"" This sentence was crisp and clear. This was also his only sentence that the reporter understood. 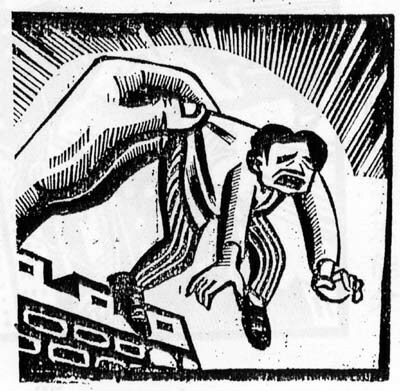 The old man tried very hard to express himself, but the words seemed to be trapped in his throat. He could only make sounds, but he could not say them. Some years ago, Liao Bingxiong had a loud voice and endless things to say. No matter to whom, no matter when, no matter if people could understand him, he would speak fluently about life, about art, about politics. In Lingyi's recollection, her father said that after the Cultural Revolution, he got back his "brain that he turned in more than thirty years ago." He spoke of current social ills and he reflected on history. She kept records, scribbling on restaurant napkins or even chopstick paper wrappers. Many people who have known Liao Bingxiong thought that it was a joy to listen to him talk. Lingyi said that her father is in great pain nowadays. Although he sat in front of the desk as before, he tried to read the newspapers for a few hours but he can no longer recognize many of the words. Newspaper reading is his sole hobby. A few years ago, he still read Southern Weekend and Nanfengchuang. He worried about people's livelihood and he worried about the "heaviness" of life. When he stayed in the hospital in 2001, Lingyi gave him a copy of Duzhe, but he put it aside because he did not like light reading. Although his thinking was still clear, he basically cannot match the speed of others. He kept repeating the same topic. He repeated many times: "The original Liao Bingxiong is dead," "He was a genius before, now he is an idiot." After his hospital stay for a stroke in 2001, Liao Bingxiong cannot communicate in depth anymore. Even his closest relatives sometimes cannot understand his special language. His memory is also fading. He is still smoking the 2.5 RMB/pack cigarettes. When he finishes one, he makes a checkmark in the notebook. After making ten checkmarks, he stops smoking for the day. He maintains the habit of keeping a diary, most of which are about the miscellaneous visitors. He writes a draft during the day, and then he copies everything in the proper diary itself at night. As the reporter left, the old man had already scribbled the words "Southern People Weekly magazine reporter came to interview." When the reporter went to Liao Bingxiong's home for the second time, he was in the study and he was smoking while laying back on the leather chair. There was a copy of Yangchang Wanbao in front of him, with the big headline "More mid-air airplane terror" There was a magnifying glass lying next to it. The old man was spirited and completely different from the first visit. He let me hold the sketchbook. He knew that a friend was visiting today. The reporter wrote down a question. He understood, he nodded, he took the pen and he wrote: "Lost memory, lost sleep." At the same time, he attempted to express this in broken Cantonese words. Lingyi was interpreting on the side and then I understood that he was saying, "A friend has come, but I can't remember the name." The 60-year-old dancer Yao Zhuzhu told me recently that Liao Bingxiong had embraced her when she was young. When she danced for the old man, he could not hear the music, he could not express his happiness or sadness, but he scrawled out "You are like a child at 60." This caused her to start crying, and Liao Lingyi was sniffing too. 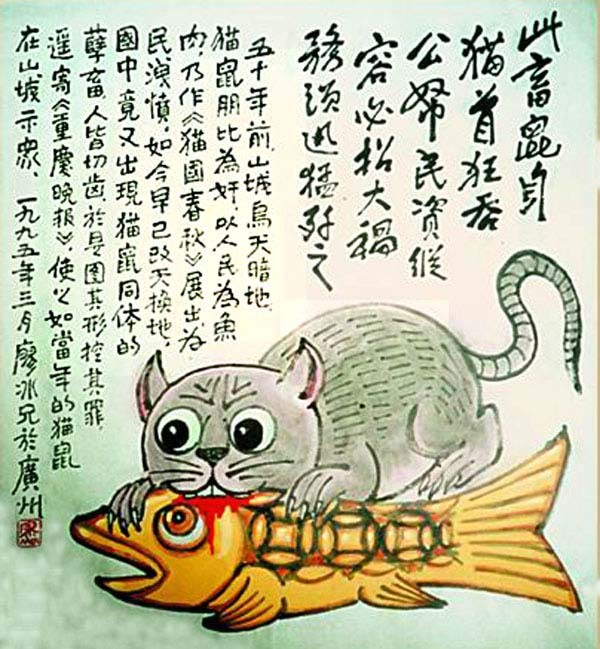 Liao Bingxiong's cartoons were unique. They were not appetizers or desserts. When you view his cartoons, you find tears in the laughter and then you will feel an indescribable sense of solemnity and oppression. He had mentioned this himself in an essay: "I feel that I am at a crossing point in the world history of cartoons. Whereas cartoons everywhere are humorous (including black humor), my works tend to express sadness and angry. They do not relax people. Instead, they make people feel oppressed and shocked." From 1932 to 1994, he spend more than 70 years in a career with many ups and downs. But Liao Bingxiong adhered to his artistic principles. He had four creative peaks in his career. 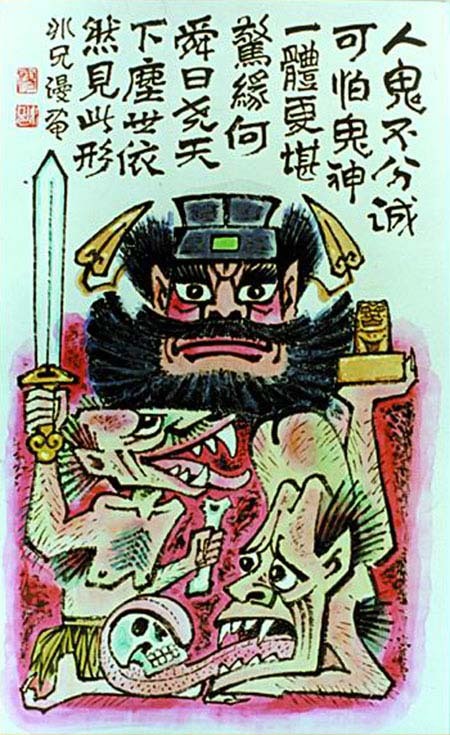 His serial cartoons during the initial stages of the anti-Japanese war of resistance and the "Annals of Cat County" against the KMT regime in the 1940's earned him the reputation of a "brilliant genius." In the three years that he spent in Hong Kong before the Liberation, he created "The Story of A-Geng" for the ordinary citizens, which some Hong Kong citizens can remember with fondness. 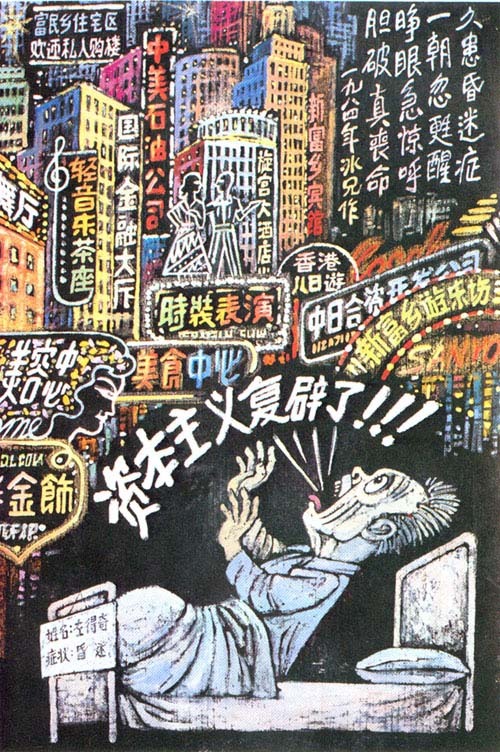 After 1979, his "Self-Deprecation" and "The Nightmare Records" created the Bingxiong era of 1980's cartoons. This humble old man assessed his own art and life much lower than others. 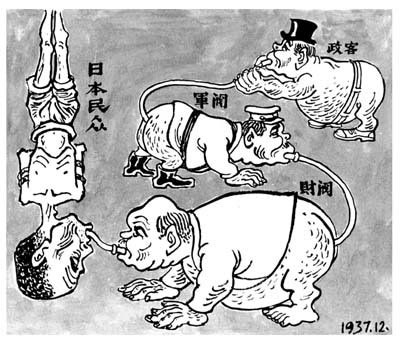 The cartoon genius Zhang Chengyu said at the end of his life to Huang Miaozi that Liao Bingxiong kept negating his own accomplishments. 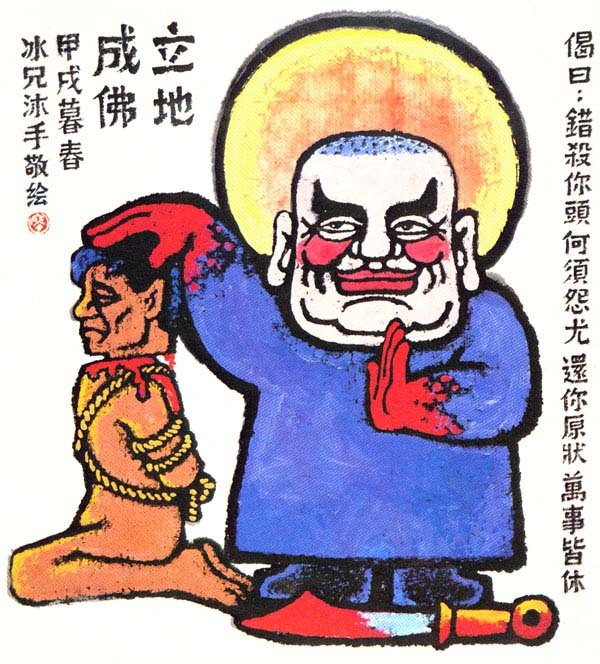 In 1979, before the sensational "Self-Deprecation" appeared, LIao nervously consulted a worker in a puppeteer company whether his cartoons were comprehensible and was relieved to receive an affirmative answer. 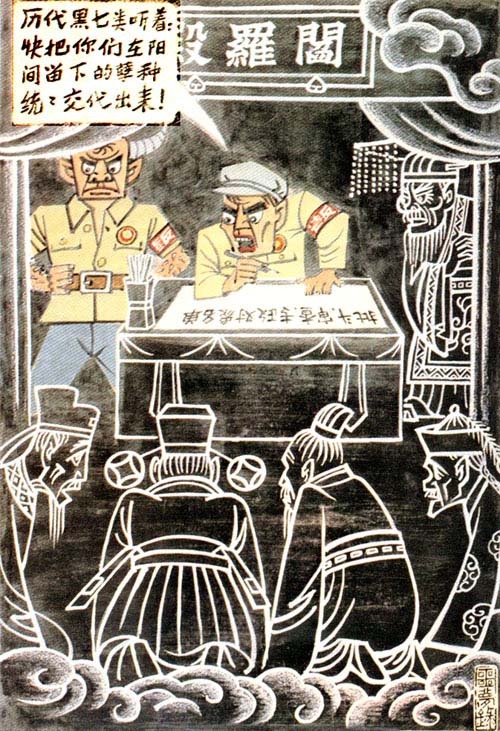 In 1979, Liao Bingxiong organized the six-person show and exhibited "Self-Deprecation" and "Annals of the Nightmare" to denounce the Cultural Revolution. This was a miracle in the cultural field even today. For the ten days or so of the exhibit, more than 10,000 people attended per day -- intellectuals and civilians surrounded the place in layers. A professor at the Guangzhou Art School went twice but could not get to see anything because he was not tall enough. The exhibit raised unprecedented self-reflection, especially "Self-deprecation" which conveyed the sense of shocked delight, terror and trembling shared by an entire generation. Zhang Yuekai, then a theater actor, was crying after he saw it. He said that he could see all the myriads of self-fear and self-reflections of intellectuals. 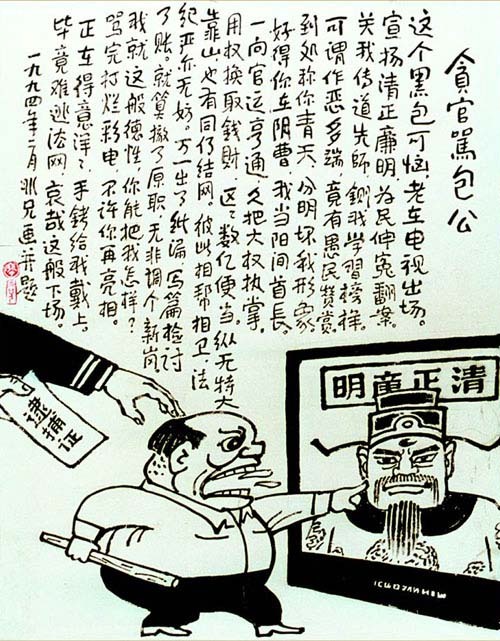 As the reporter flipped through the works of Liao Bingxiong, the old man saw "Self-deprecation" and he immediately raised his thumb and said that this was his best work ever. In the Six-Person Exhibit, Liao Bingxiong wanted to commemorate Zhang Zhixin for paying with his life by speaking the truth. So he set up a creative concept akin to performance art: at the entrance, there was a mirror with the words: "Communist Party members, please look at yourselves" in order to warn the world. He also re-drew his early work "Banning Speech" in which the deadly struggle between the rooster and the owl represented the struggle between light and darkness. 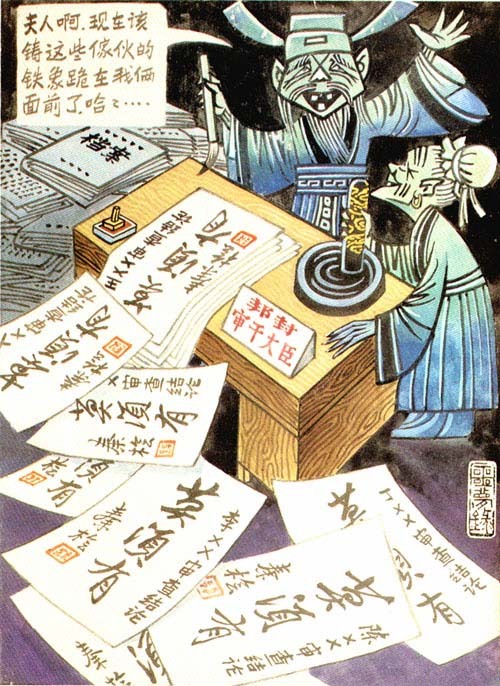 Among the many discussions of his cartoons, he is most satisfied with that of Zhu Jinlou, the chief editor of Chinese Cartoons in the 1930's. 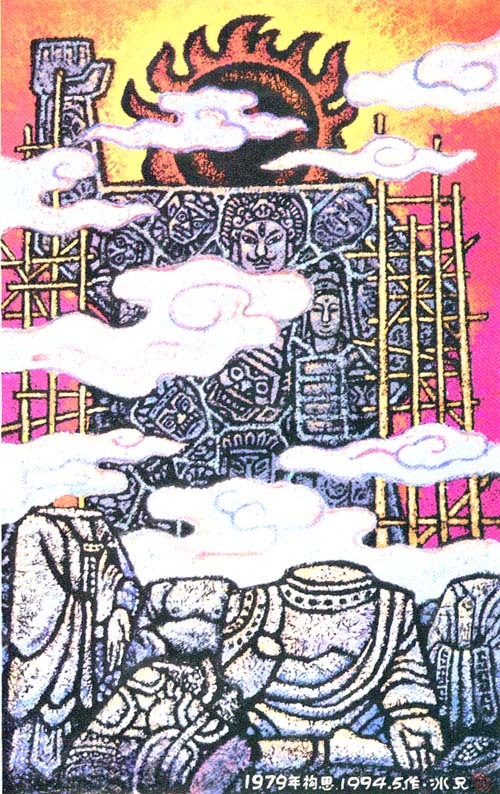 "Liao Bingxiong's cartoons are heavy like a beam hanging over your head and about to fall down; strange like you seeing a huge meteor falling in front of you in a bad dream; ominous like ancient peasants seeing a rainbow piercing the sun; terrifying like a strange corpse lying next to a grave or a widow crying by an oil lamp in the middle of the night! ..."
Yes, he was condemning all evil, deception, oppression, greed, cruelty, lowliness, baseness, obscenity, shamelessness, selfishness, toadyism, viciousness, menace, insidiousness, ... everything that was killing the good and the kind. 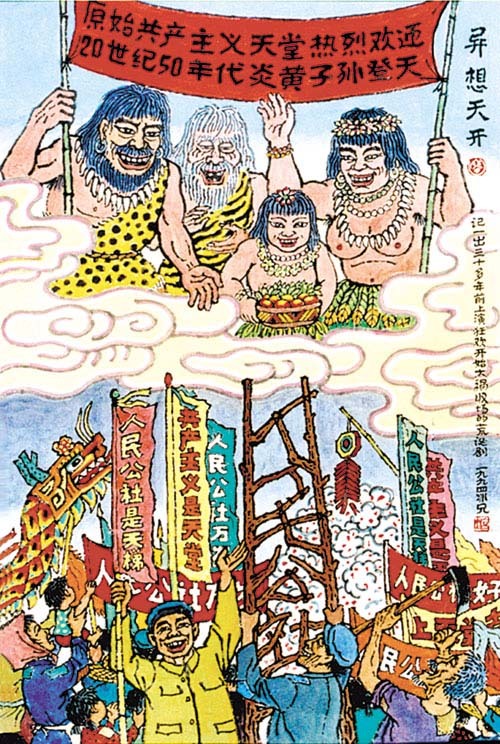 Only Liao Bingxiong among all cartoonists could record the sorrowful history of China in more than half a century. The times made Liao Bingxiong. The old man did not deny this: "Four persons made my life. The first is the Japanese Emperor, because my cartoons were created for the sake of national salvation. One is Chiang Kai-shek. One is Mao Zedong. One is Deng Xiaoping." Since the 1930's he began to join progressive organizations. 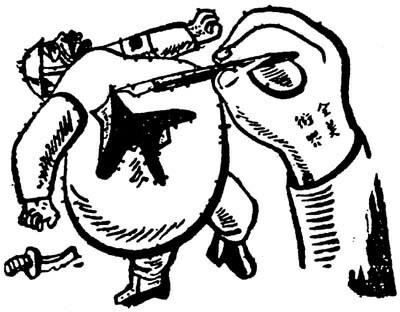 In 1937, he joined the cartoon propaganda team under the Military Committee Third Bureau led by Guo Moruo. 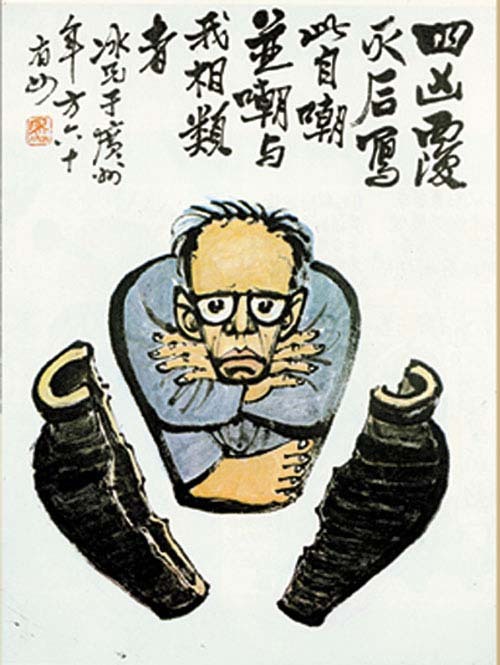 In 1947, he joined the People's Painting Club led by the Chinese Communist Art Committee. Like most Chinese people, Liao Bingxiong looked forward to and embraced the new China with a passion. He participated actively during the various movements during the initial years of the nation. "Three Anti's," "Five Anti's," "Anti-rightist" and then he was classified as a rightist himself. 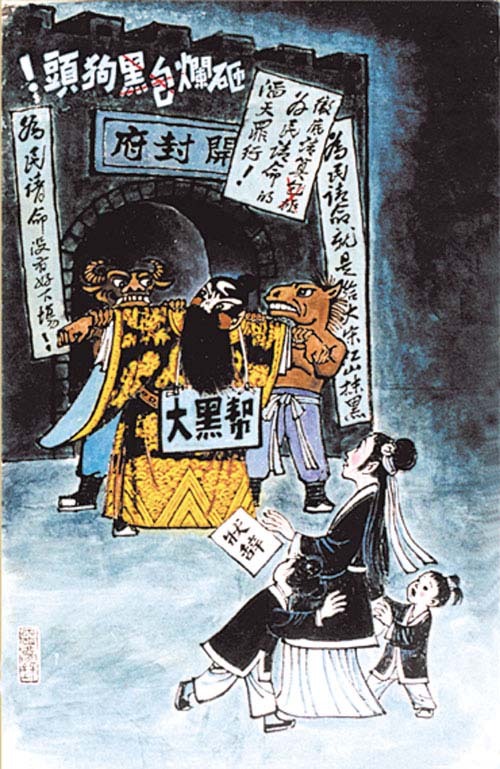 During that period, he drew large numbers of laudatory paintings and participated in the criticisms against Hu Feng. Then Guangdong provincial party secretary Tao Zhu regarded him as an active element in the cultural battlefront. The old man recalled this historical era: "At the time, I had to criticize myself. I also did many bad things." 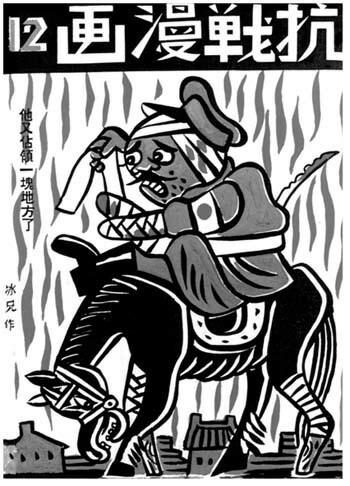 In 1957, Liao Bingxiong drew the series "Poems of encouragement -- for the dogmatists." Although this was done upon orders, he was accused of being a rightist. 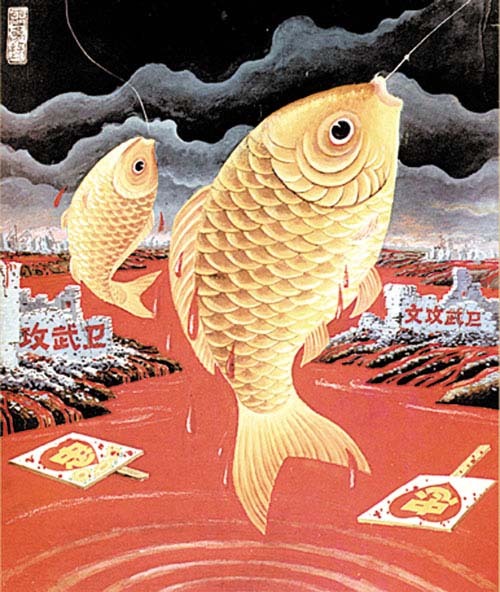 More dramatically, during the anti-rightist period, he was on loan to the Guangdong provincial Industrial and Commerce Department to draw anti-rightist cartoon posters. "The rightist attacks the rightists, using poison on poison." Later on in life, Liao Bingxiong thought this was risible. But at the time, he did not think it was funny and he took his work seriously. "My father would rather believe that he was wrong, rather than thinking that the party that he always thought was right could be wrong," said Liao Lingyi about her father's state of mind. Even if friends said that the Communists can sometimes be wrong, he would stop them and say, "You can't say that, you can't say that." Liao Bingxiong thought that he had been wrong, and he lived faithfully and humbly without producing anything for 22 years. 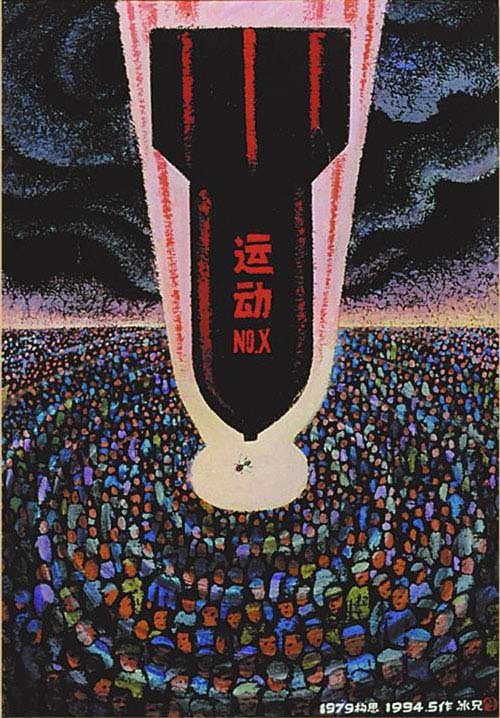 ... Liao Bingxiong spent his life in pursuit of truth, goodness and beauty and this is evident in his cartoons. Even though his work during the initial stages of new China were done upon orders, he took it seriously because he genuinely believed in the ideals of Communism. Lingyi said, "When my father was criticized, he could not hear what people were saying due to partial deafness. But he took it seriously and lowered his head while sticking his hearing aid closer to the mouth of the speaker like in an interview. Sometimes, the tall hat would fall off his head. He would have to stoop down, pick up the tall hat, flick the dust off and put it on his head again. Almost everybody wanted to laugh aloud, but they did not dare to do so. So some people had to sneak out to laugh." This authentic humorous episodes protected him. In recalling these events, Lingyi could not help laughing while she imitated what her father did with the hearing aid. "Father treated people fairly, so it was hard to hate him." Later, Liao Bingxiong said that he was more fortunate than his northern friends such as Wu Zuguang, Huang Miaozi and Yu Feng. During the Cultural Revolution, Liao Bingxiong wrote several hundred thousands of words of "confessional material." During the time in Chongqing, he had been a visitor to the Erliaotang, and so he had to state that he met people such as Xia Yan, Guo Moruo, Huang Miaozi, Ye Qianyu, Zhang Leping, and even his first girlfriend. But the excessive sincerity of the old man caused troubles for other people. He described the mysterious circumstances under which his first girlfriend left him, and he wondered if she was a Kuomintang spy who could not marry him even during a time when the Communists and KMT were collaborating. This Hangzhou woman was investigated many times during the Cultural Revolution. In the 1980's, the old man finally found out that the girlfriend left him because she had an experience of having been raped. The old man had to sigh and wondered how this could be any reason to separate. "He actually loves her a lot," said Lingyi softly. ... After the glorious period of "Self-Deprecation," Liao Bingxiong found it harder and harder to work. He wanted to take more time to think and reflect before he picked up the pen. "I am not producing firecrackers that go off quickly. I am building an atomic bomb that requires a long time to store the energy to be released very quickly." The 1994 work "Records from Broken Dreams" were the result of more than ten years of thinking. 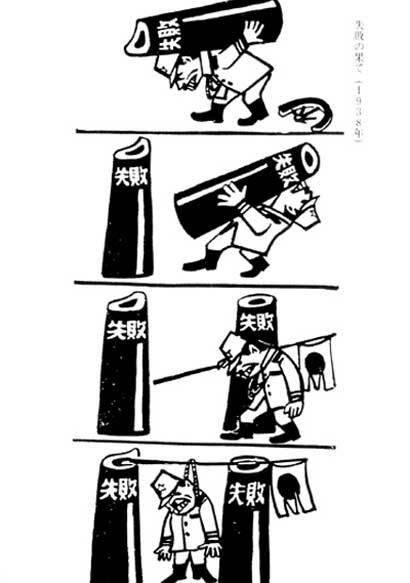 After 1994, Liao Bingxiong drew very few cartoons. "Father does not want to draw 'itch-scratching' sarcastic works about 'spitting on the ground' or 'using the back door.' He wanted to deal with the nature of society itself. He emphasized that cartoons are drawn to record history." Lingyi is responsible for collecting the materials of her father, and so she knows her father's creative ideas thoroughly. Following the rapid social transformation in the late 1990's, Liao reflected: "Reality is even more exaggerated than my imagination." Thus he quit drawing cartoons. Here are some samples of the works of Liao Bingxiong. 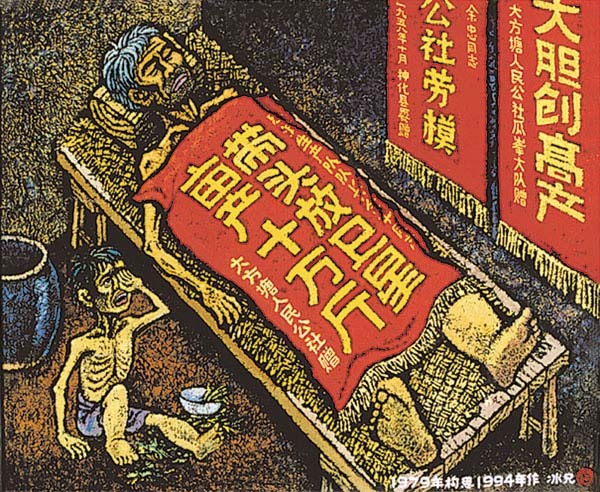 The black-and-white cartoons come from the Anti-Japanese War of Resistance era, while the color cartoons come from after the Cultural Revolution.